Royal Enfield has grown its model range for the Malaysian market with a pair of new additions, the Interceptor 650 and the Continental GT 650. Priced at RM45,900 and RM48,500 respectively (excluding insurance and registration), both are powered by an air- and oil-cooled, dual overhead cam and fuel-injected parellel twin displacing 648 cc. The engine produces 47 hp at 7,250 rpm and 52 Nm of torque at 5,250 rpm, with transmission handled by a six-speed gearbox and chain final drive. Differences are in the layouts, with the Interceptor a more upright cruiser-style machine, while the Continental GT adopts a more cafe racer stance. As such, the Interceptor features a flatter seat and flat handlebars, while the Continental GT gets a more stretched-out posture courtesy of its clip-on bars, together with a seat with a more pronounced contour. The Interceptor also gets a larger fuel tank, which holds 13.7 litres to the Continental GT’s 12.5 litres. Suspension on both bikes are handled by 41 mm telescopic forks in front, with dual shocks (each with gas reservoir) taking care of the rear. Braking is via a single-disc setup with a ByBre caliper on both the Interceptor and Continental GT, augmented with ABS for safety. The Interceptor 650 tips the scales with a dry weight of 202 kg, while the Continental GT 650 weighs 198 kg dry. Rolling stock on both models are 18-inch wire-spoke wheels shod in tyres measuring 100/90 and 130/70 front and rear, respectively. Each purchase of either of the classically-styled duo comes with a three-year, unlimited-mileage warranty. The post Royal Enfield Interceptor 650, Continental GT 650 launched in Malaysia – priced from RM45,900 appeared first on Paul Tan's Automotive News. 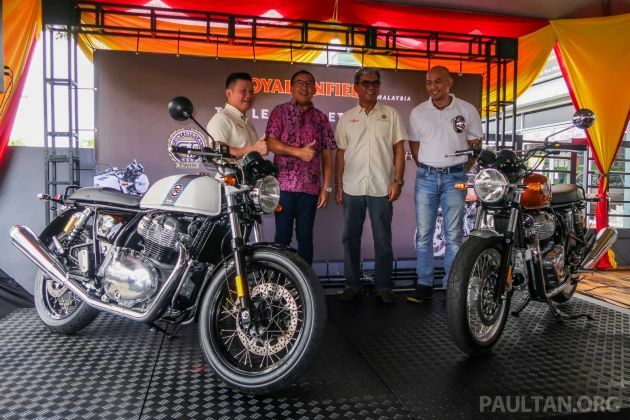 0 Response to "Royal Enfield Interceptor 650, Continental GT 650 launched in Malaysia – priced from RM45,900"